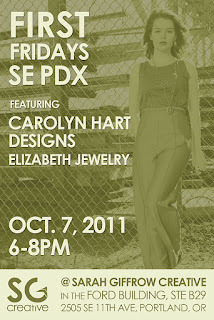 I am doing a First Friday event with Sarah Giffrow Creative and Elizabeth Jewelry! Sarah photographed my FW11 collection which will be on display at this event. I absolutly adore her and feel so lucky to have worked with her. This will be the first time working with Molly of Elizabeth Jewelry and I couldn’t be more thrilled. She makes gorgeous handcrafted silver jewelry I could see my self wearing everyday. Feel free to pop by and say hello and have some wine!